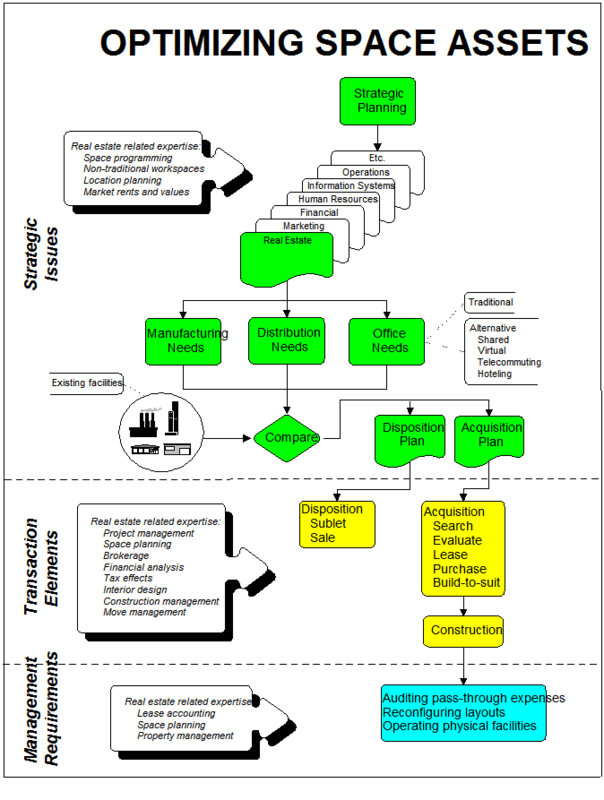 As illustrated in the chart at the bottom of the page, the activities required of an organization to govern and control its real estate assets can be categorized into three distinct groups: (1) strategic issues, (2) transaction elements and (3) management requirements. Various types of real estate related expertise are required in all three of these in order to optimize the organization's space assets. Within the first group, space programming (trade jargon for the determination of space requirements) is a key element in addressing the strategic issues concerning real estate. Likewise, early consideration of the types and sizes of workspaces that will best serve the organization's operations can have a significant effect on the amount of space that will ultimately be needed. And, of course, location and cost considerations always exert strong influences on a strategic plan. To bring the most effective levels of real estate expertise to the organization, we recommend a team be formed, with a core consisting of a commercial real estate broker who specializes in representing space users, an architect with a strong practice in the types of space the organization requires, and an individual from the user organization who will take on liaison responsibilities. As portrayed in The Real Estate Team chart, the individuals comprising the team core will perform, or obtain and coordinate, all required services and activities. Depending upon the size of the organization, the team may also include representatives of top management and/or a user committee. Discussions on the subjects of Choosing A Broker and Engaging An Architect may be found within this web site.